The Nepal River Conservation Trust (NRCT) is a non-profit organization that was established by a group of concerned river guides who recognized the ecological and cultural damage that was taking place on Nepal's rivers at an alarming rate. Since its inception in 1995, the NRCT has worked towards conserving Nepal's Himalayan river system, preserving Nepal's cultural heritage and developing an environmentally responsible river tourism industry, please look at calendrier disneyland. WHAT DOES THE NRCT DO? 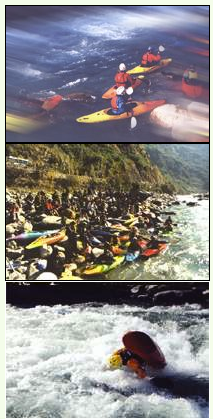 The NRCT hosts the Annual River Festival and the Bagmati River Festival to raise the awareness among all river users about the need to conserve the river, and develop an economical and environmentally sustainable river tourism industry. This year's Annual River Festival will be held in early December, 2001 and will incorporate adventure tourism activities, such as down river rafting races, with environmental education seminars and live entertainment. For those who want to have some fun and help save some of the world's most beautiful rivers at the same time, the event is not to be missed! For further information please contact us or keep your eye on this web site. The NRCT has drafted and is in the process of implementing an environmentally responsible Code of Conduct (link to code of conduct) for rafting in Nepal's rivers. The NRCT also holds river guide training workshops on environmentally sound rafting and camping practices guides who recognized the ecologicaland cultural damage that was taking place on Nepal's rivers at an alarming rate. Since its inception in 1995, the NRCT has worked towards conserving Nepal's Himalayan river system, preserving Nepal's cultural heritage and developing an environmentally responsible river tourism industry. The NRCT studies the environmental condition of Nepal's rivers. It is the NRCT's long term aim to regularly monitor the environmental state of Nepal's entire river system. The NRCT has already completed environmental impact studies on the Bhote Koshi River, the Kali Gandaki River and the Trishuli River. The NRCT runs conservation programs. Recent projects include cleaning up river campsites, and tree plantation exercises. The NRCT runs community development programs, including supporting a public school in the local village of Jamune, along the Karnali River, developing and implementing an appropriate sanitation and hygiene program at the Jirpoo Secondary School. The NRCT lobbies on a local, national and international level to improve the state of Nepal's rivers. Current campaigns include opposing the large scale damming of Nepal's best rafting rivers and placing the Karnali River on the World Heritage List. On August 11, over 35 river guides and over 100 rafting enthusiasts, environmentalists, tourists, journalists and even two satirists donned protective gloves and face masks and traveled down a section of the Bagmati River, right through the heart of Nepal's capital city. Their excursion was the key event of the Bagmati River Festival, which aimed to draw attention to the river's sorry plight, and prompt the community and the Government to take action and start cleaning up the river. The day began at Sundarijal, where the kayakers negotiated through pristine rapids, and then down into Gujeswori and Tilganga, where they were joined by the rafters, and the pollution that was the impetus for the excursion. Together, the rafters and the kayakers floated down Nepal's holiest yet most ecologically damaged river until they reached Sankhamal. Festival goers, that included the likes of comedians Madan Krishna Shrestha and Hari Bansha Acharya, then participated in a tree plantation and cultural programs and listened to environmental speeches and the performance of band, 1974AD Band. Festival brainchild and Nepal River Conservation Trust President, Megh Ale, told the Kathmandu Post that he was completely satisfied with the awareness the festival generated, "but the real success would be felt only if local people as well as the policy makers realise the need to keep the Bagmati River clean." "We can no longer stay still and do nothing," he said. It is the NRCT's vision to see children and fish swimming in the Baghmati, to see pilgrims taking a holy bath in the Baghmati without any hesitation and to have all the residents of Kathmandu Valley love and respect this beautiful river. Unfortunately, it is human mismanagement that has led to the Bagmati being horribly polluted with sewerage, industrial pollution, human waste and garbage. "I thought they were joking when they handed me a face mask and gloves, but they weren't," said the kayaking expedition's sole female participant, Claire Johns. "It was almost like kayaking in Scotland in winter except in Scotland I was scared of touching the icy water because it would freeze if it touched my skin, and in the Bagmati I was scared of touching the water because I didn't want to get sick." But overall, she described the experience of kayaking down the Bagmati River, giving children rides on the back of her boat and seeing the temples and the burning Ghats as amazing. "It was also great to see the hundreds of enthusiastic locals encouraging the river expedition from the bridges, " she said. "Hopefully some of them will realise how important Nepal's rivers are to the Nepalese people, and not just the foreigners who come here to ride the white water." Rafting agency Ultimate Descents river guide, Gauta Tamang, was also enthusiastic about the local community's response to the festival. "The kids were really excited to see rafts going down the river," he said. "A lot of them have never even seen rafting before." "Maybe since they've seen us rafting down the river they might stop polluting the Bagmati," he said. "Everyone knows the river is dirty but I think they have forgotten how dirty. It's our holy river and we should respect it." According to NRCT, people can help save the Bagmati River by treating all waste water with a septic tank, not throwing garbage into the river, composting all organic matter at home and joining a local organisation that is working towards improving Kathmandu's most important river.